One of my favorite stories of the past year concerns Michael Giacchino — the composer of Ratatouille, Up and the Star Trek films — who, exhausted from scoring four major films in 2016, was all set to go on vacation when the phone rang, asking him if he might squeeze in a Star Wars film before the end of the year. 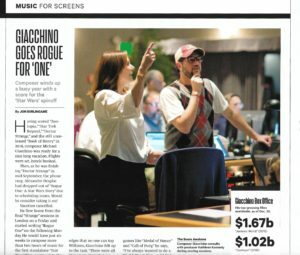 How he got to do Rogue One, and how he went about it, is the subject of a story I wrote for this week’s Music section of Variety. Along the way I also mention two of my other favorites of his this year: Marvel’s Doctor Strange and Disney’s Zootopia. This entry was posted in Composers, Film Music, Interviews and tagged Doctor Strange, film music, Michael Giacchino, Oscar contenders, Oscar music, Rogue One, Star Trek, Star Wars, Variety, Zootopia on January 5, 2017 by Jon Burlingame.